The Far Side is back in this much-anticipated three-volume slipcased paperback edition of The Complete Far Side! “Every one of these cartoons is just something that drifted into my head when I was alone with my thoughts. And, for better or worse, I ‘jotted’ them down. It was only later, when perhaps I received an angry letter from someone, that it struck me: Hey! Someone’s been reading my diary!” --Gary Larson, from the preface to The Complete Far Side Originally published in hardcover in 2003, The Complete Far Side was a New York Times bestseller. 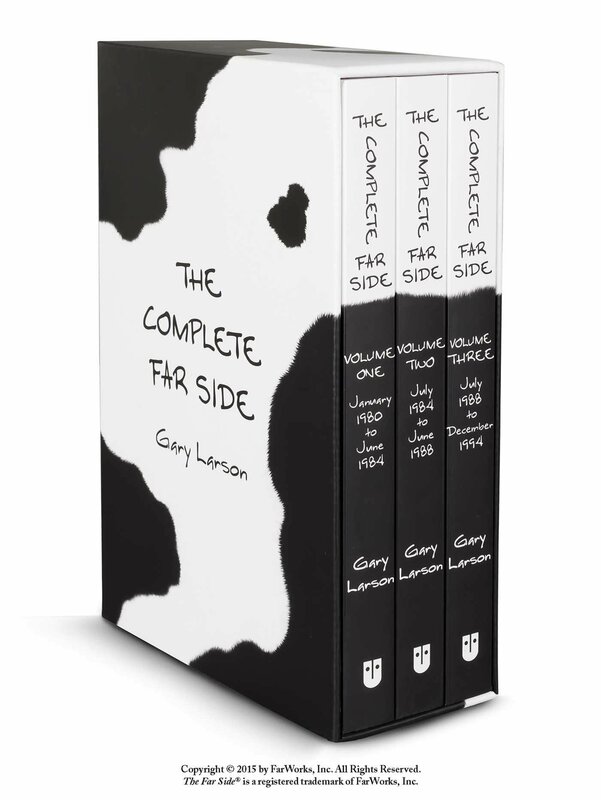 Now it’s back as a paperback set with a newly designed slipcase that will delight Far Side fans. Revered by its fans as the funniest, most original, most “What the ... ?”-inspiring cartoon ever, The Far Side® debuted in January 1980 and enjoyed an illustrious 14 years on the world’s comics pages until Gary Larson’s retirement in 1994. The Complete Far Side celebrates Larson’s twisted, irreverent genius in this ultimate Far Side book. A masterpiece of comic brilliance, The Complete Far Side contains every Far Side cartoon ever syndicated--over 4,000 if you must know--presented in (more or less) chronological order by year of publication, with more than 1,100 that had never before appeared in a book. Also included are additional Far Side cartoons Larson created after his retirement: 13 that appeared in the last Far Side book, Last Chapter and Worse, and six cartoons that periodically ran as a special feature in the New York Times Science Times section as The Far Side® of Science. Creator Gary Larson offers a rare glimpse into the mind of The Far Side® in quirky and thoughtful introductions to each of the 14 chapters. Complaint letters, fan letters, and queries from puzzled readers appear alongside some of the more provocative or elusive panels. Actor, author, and comedian Steve Martin offers his sagacious thoughts in a foreword, and Larson’s former editor describes what it was like to be “the guy who could explain every Far Side cartoon.” During its 14-year run, The Far Side® was syndicated internationally to over 1,900 daily newspapers. It spawned 23 books and has been translated into 17 different languages.